A percussion instrument can be any object which produces a sound by being struck, shaken, rubbed, and scraped with an implement, or by any other action which sets the object into vibration. The term usually applies to an object used in a rhythmic context with musical intent. The word, "percussion," has evolved from the Latin terms: "Percussio" (which translates as "to beat, strike" in the musical sense, rather than the violent action), and "percussus" (which is a noun meaning "a beating"). As a noun in contemporary English, it is described as "the collision of two bodies to produce a sound." The usage of the term is not unique to music but has application in medicine and weaponry, as in "percussion cap," but all known and common uses of the word, "percussion," appear to share a similar lineage beginning with the original Latin: "Percussus." In a musical context, the term "percussion instruments" may have been coined originally to describe a family of instruments including drums, rattles, metal plates, or wooden blocks which musicians would beat or strike (as in a collision) to produce sound. Percussion imitates the repetition of the human heartbeat. It is the most primal of all forms of expression. From aboriginal times, every civilization has used the drum to communicate. Anthropologists and historians often explain that percussion instruments were the first musical devices ever created. The first musical instrument used by humans was the voice, but percussion instruments such as hands and feet, then sticks, rocks, and logs were the next steps in the evolution of music. "Idiophones produce sound when their bodes are caused to vibrate." Lion's roar: The lion's roar might be, incorrectly, considered a "chordophone" as rope or string are used to activate the membrane; however, it is the membrane which sounds. Wind machines: A wind machine in this context is not a wind tunnel and therefore not an aerophone. Instead, it is an aparatus (often used in theater as a sound effect) in which a sheet of canvas (a membrane) is rubbed against a screen or resonator—this activity produces a sound which resembles the blowing of wind. Most instruments known as "chordophones" are defined as string instruments, but such examples are also, arguably, percussion instruments. It is in this paradigm that it is useful to define percussion instruments as either having definite pitch or indefinite pitch. 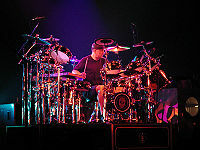 For example, some instruments such as the marimba and timpani produce an obvious fundamental pitch and can therefore play a melody and serve harmonic functions in music while other instruments such as crash cymbals and snare drums produce sounds with such complex overtones and a wide range of prominent frequencies that no pitch is discernible. Instruments in this group are sometimes referred to as "pitched" or "tuned percussion." Instruments in this group are sometimes referred to as "non-pitched," "unpitched," or "untuned." This phenomenon occurs when the resultant sound of the instrument contains complex frequencies through which no discernible pitch can be heard. Although it is difficult to define what is "common knowledge," there are instruments in use by percussionists and composers in contemporary music which are certainly not considered by most to be musical instruments of any kind. Therefore, it is worthwhile to make a distinction between instruments based on their acceptance or consideration by a general audience. 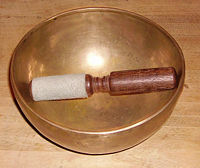 For example, most people would not consider an anvil, a brake drum (the circular hub on modern vehicles which houses the brakes), or a fifty-five gallon steel pans from oil barrels to be musical instruments, yet these objects are used regularly by composers and percussionists of modern music. John Cage, Harry Partch, Edgard Varèse, all of whom are notable composers, have created pieces of music using unconventional instruments. Beginning in the early 20th century, perhaps with Ionisation by Edgard Varèse which used air-raid sirens (among other things), composers began to require percussionists to invent or "find" objects to produce the desired sounds and textures. 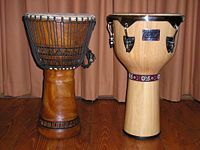 By the late twentieth century, such instruments had become common in modern percussion ensemble music and popular productions such as the off-Broadway show, Stomp. It is not uncommon to discuss percussion instruments in relation to their cultural origin. This has led to a dualism between instruments which are considered "common" or "modern" and those which have a significant history and/or significant purpose within a geographic region or among a specific demographic of the world's population. Percussion instruments can play not only the rhythm, but also the melody and harmony. Percussion instrumentation is commonly referred to as "the backbone" or "the heartbeat" of a musical ensemble, often working in close collaboration with bass instruments, when present. In jazz and other popular music ensembles, the bassist and the drummer are oftened referred to as the "rhythm section." Most classical pieces written for full orchestra since the time of Haydn and Mozart are orchestrated to place emphasis on the string instruments or strings, woodwinds, and brass instruments. Often, at least one pair of timpani is included, though they rarely play continuously but serve to provide additional accents when needed. In the eighteenth and nineteenth centuries, other percussion instruments (like the triangle or cymbals) have been used, again relatively sparingly in general. The use of percussion instruments became more frequent in twentieth century classical music. 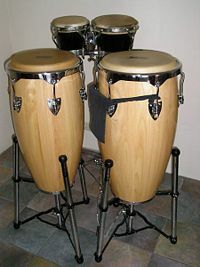 In almost every style of music, percussion instruments play a pivotal role. In military marching bands and pipes and drums, it is the beat of the bass drum that keeps the soldiers in step and at a regular speed, and it is the snare drum that provides that crisp, decisive air to the tune of a regiment. In classic jazz, one almost immediately thinks of the distinctive rhythm of the "hi-hats" or the ride cymbal when the word "swing" is spoken. In more recent popular music culture, it is almost impossible to name three or four rock, hip-hop, rap, funk, or even soul charts or songs that do not have some type of percussive beat keeping the tune in time. Because of the diversity of percussive instruments, it is not uncommon to find large musical ensembles composed entirely of percussion. Rhythm, melody and harmony are usually present in these musical groups, and they are quite a sight to see in a live performance. Music for pitched percussion instruments can be notated on a musical staff with the same treble and bass clefs used by many non-percussive instruments. Music for percussive instruments without a definite pitch can be notated with a specialist rhythm or percussion clef. More often a treble clef (or sometimes a bass clef) is substituted for a rhythm clef. Blades, James. Percussion Instruments and Their History. New York: F.A. Praeger, 1970. Percussion Anthology: A Compendium of Articles from the Instrumentalist on Percussion Instruments. Evanston, Ill: Instrumentalist Co., 1980. Home Page, Percussive Arts Society.